Coiste ScÃ³r AGM and Launch of ScÃ³r for 2015/2016. Please note that Coiste ScÃ³r AGM is changed and will now take place at Ãire Ãg Pavilion on Thursday 29th October, 2015 at 8 pm sharp. 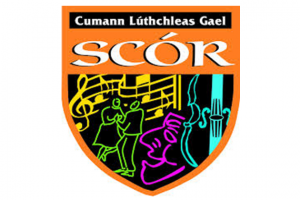 The Launch of County ScÃ³r for 2015/2016 will take place immediately afterwards and will be performed by Mr Ger Lane, Cathaoirleach, CLCG Coiste Contae ChorcaÃ­. LÃ©iriÃº StÃ¡itse - which depicts a stage presentation with a theme based on an aspect of Irish Life, culture or folklore. It would be a dramatic presentation in serious or comic form and clubs could include music, song or dance in the presentation. The quality of the music, song or dance would not be an issue in the adjudication. Competitors are informed that the marking will be based on theme and the production rather than the quality of any singing or music that is included. We are making a special appeal to all Clubs to send their Cultural Officer, ScÃ³r Rep or a representative to attend the AGM of ScÃ³r this year and the Launch immediatly afterwards, please.